As creators and educators in the children’s literature field we need support and up-to-date knowledge of the industry to help us continue, and succeed, on our writing and teaching journeys. With opportunities to have work published, profiles discovered and resources on hand, we applaud those generous literary magazines and e-zines that do just that. Buzz Words accommodates to writers and illustrators, as well as editors, teachers and librarians. The e-zine features loads of opportunities to learn and share in writing tips and interviews, current competitions, conferences, courses and book reviews. Founded and run by the incredible Dianne Bates, Buzz Words is a thriving industry magazine. For more information visit the Buzz Words website, Facebook page or contact Di at dibates@outlook.com. A full profile can also be found at the Just Kids’ Lit Directory. 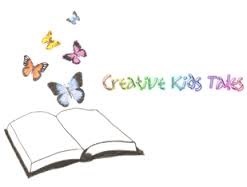 Creative Kids Tales was founded by Georgie Donaghey with the motto, ‘Helping stories come to life.’ It is a fantastic website containing comprehensive tools, tips, events, resources and reviews to assist creators in the field on their journeys to publication. Subscribing to Creative Kids Tales will serve its members with access to a profile and opportunities to submit manuscripts for promotion. Visit the website, Facebook page and Just Kids’ Lit Directory listing at the links. 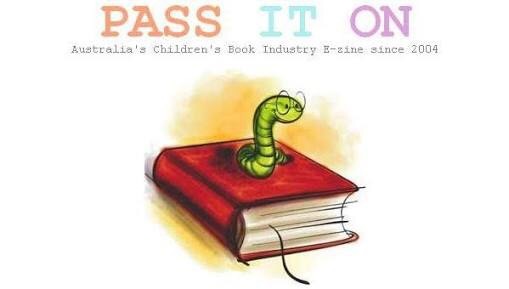 Pass It On is an online newsletter incorporating valuable information about the children’s writing and illustrating industry. Jackie Hosking is the editor of Pass It On and does a tremendous job of putting together a range of networking opportunities, resource lists, author and illustrator profiles and more. Find out more at Jackie’s PIO website and Facebook page. 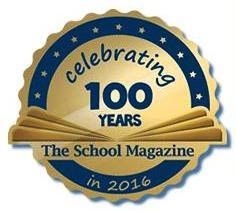 The School Magazine is celebrating its 100th anniversary this year, with a big event being held at the Royal Botanic Garden in Sydney! This wonderful Australian literary magazine for young readers is a vital resource for teachers, parents, students, authors and illustrators. Literally bringing the world of words to its readers, The School Magazine is lively and rich in content by offering different genres, activities, profiles, book reviews, fan mail letters and competitions. Available for subscription purchases and submission opportunities for emerging and established writers and artists. Visit The School Magazine at their website and Facebook page. Junior Books + Publishing, subsidiary of Books+Publishing; Australia’s number-one source of news, events, bestsellers, awards, interviews, job advertisements and classifieds in the book industry. A subscription to their quarterly print magazine, newsletters and online access also includes pre-publication reviews of Australian books, with the Junior magazine focusing on children’s and YA books. For more information please go to the Books+Publishing website or visit the Junior Books+Publishing Facebook page. 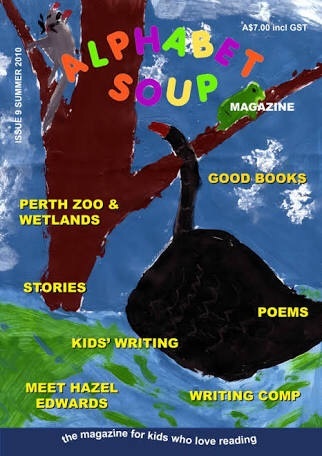 Alphabet Soup magazine was originally an Australian literary magazine aimed at children between six and twelve years old. Now a website and blog, it includes gorgeous book reviews, stories and poems, and artwork by kids, as well as creative writing tips, teacher resources, interviews and themed events and activities. Find Alphabet Soup magazine at their website and Facebook page. Magpies Magazine and The Literature Base are magazines created by Australia’s online subject guide to children’s literature; The Source. Magpies: Talking about books for children, is published five times a year. It includes reviews of current Australian and overseas books, relevant articles on children’s literature, interviews, and award and events information. The Literature Base is published four times per year, containing practical ideas for using books in the classroom as well as book lists, worksheets and reviews. To subscribe please visit their website. Reading Time Online is a terrific online collection of Australian book news and reviews from The Children’s Book Council of Australia. It includes all the latest publications of quality children’s literature, as well as celebrating awards and events and a range of author and illustrator interviews. Personally, it is my go-to site to find the most recent book releases, plus I’ve thoroughly enjoyed reviewing for them, too! Reading Time Online can be found at their website and the CBCA Facebook page.